Shipments of quality USED office furniture coming in on a regular basis! C.J. Office Furniture is a family owned and operated business which has been serving the Tri-State area since 1987. 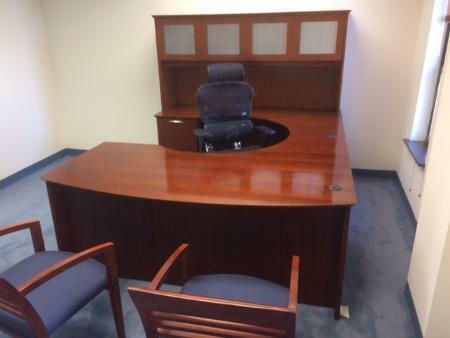 We are one of the premier USED office furniture resellers in New Jersey. You can take great comfort in knowing that when you purchase from C J Office Furniture, you are receiving the best products and customer service. We sell cubicles, desks, credenza's, conference tables, office chairs, reception desks, file cabinets and desk chairs, just to name a few. We also sell new furniture. Why buy new for your next project when you can purchase beautiful pre-owned commercial office furniture for pennies on the dollar! Come visit us today and SAVE! Don't miss out, pre-owned furniture arriving regularly. Products Carried: Pre-owned office furniture, i.e. L shaped desks, U configurations, conference tables, desk chairs, reception chairs, cubicles, lateral & vertical files, etc. Reservations: Appointments appreciated but walk ins are always welcome. Delivery: We deliver and install our product.